The year 2016 was a eventful one for the Squannacook River Rail Trail. 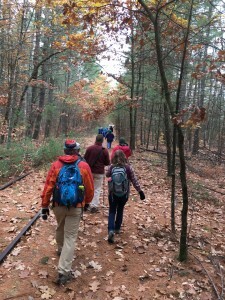 After twelve years of effort, Squannacook Greenways signed the MBTA lease for the unused rail bed in Townsend and Groton in 2015. 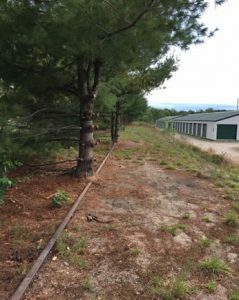 With this lease, our non-profit won the right to construct a rail trail, and the public won legal access to this rail bed for the first time since the Peterborough and Shirley Railroad was constructed in the late 1840’s. With legal access to the rail bed, our first priority was to finally let the public walk the rail bed for themselves. We felt that when people saw for themselves how the rail trail will make it so much easier to walk or bicycle around our area, they would understand the enthusiasm we felt for this project. They would see why we feel that this rail trail will transform what its like to grow up and live around here. 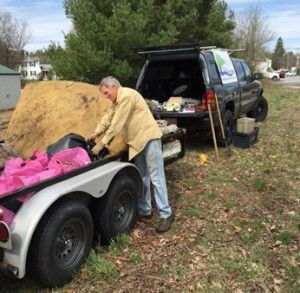 In April 2016, Squannacook Greenways held its first annual Earth Day rail trail clean up. Over 25 volunteers showed up and removed 75 bags of trash from the rail bed. Our thanks to the Town of Townsend for sponsoring this event town-wide. Volunteers helping to make the rail bed walkable. To make the trail easily walkable from one end to another, one final section near Harbor Pond needed to be cleared. 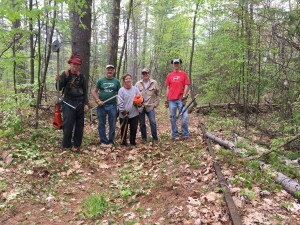 Squannacook Greenways won approval for this work from the Townsend Conservation Commission, and in May 2016, a group of board members and a few volunteers worked to clear the last section of the rail bed without a walking path next to it. Benjamin Chidester of Townsend did his Eagle Scout project along the rail trail. This was not the only clearing that occurred in 2016. 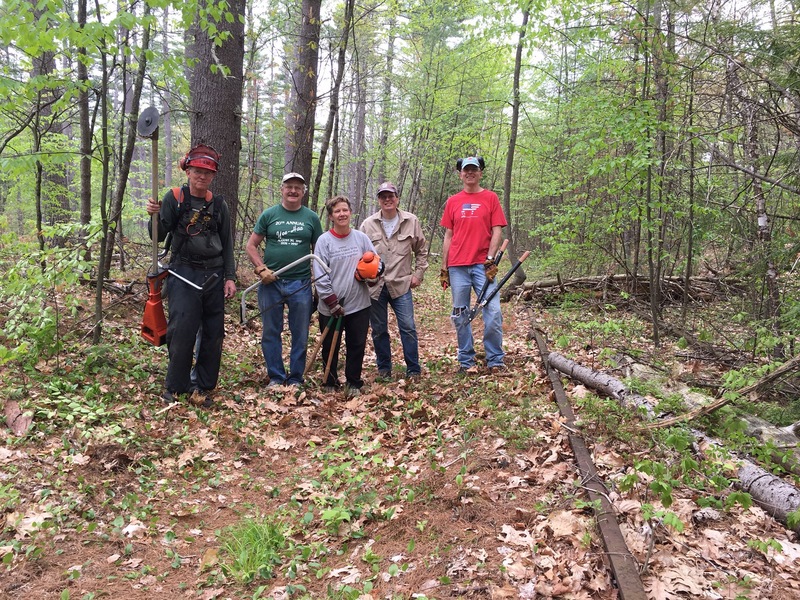 Benjamin Chidester of Townsend organized a group of scouts to help clear a section of the Squannacook River Rail Trail near Depot Street in Townsend, as his Eagle Scout project. Our sincere thanks to Benjamin and all the scouts who helped make the Squannacook River Rail Trail walkable from one end to another. green arrow trail markers along the Squannacook River Rail Trail. Our hope is that these markers will encourage everyone to come out and walk the trail, and so see for yourselves that the stone dust trail will provide residents wanting to bike or walk from one part of town to another a safe alternative to the busy and dangerous Route 119.
guided one way walk of the Squannacook River Rail Trail. We were thrilled when over 60 people turned up to enjoy the walk. 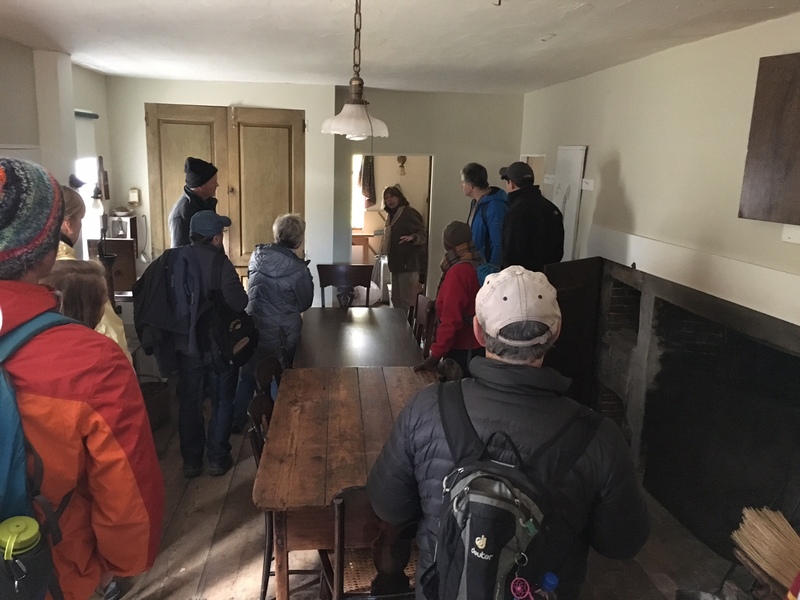 Thanks to everyone who attended, and thanks to the Townsend Historical Society for offering walkers a tour of the Reed Homestead. The walk included a tour of the Townsend Historical Society’s Reed Homestead. Not only was 2016 an exciting year for the Squannacook River Rail Trail because of the public events, it was also a year that moved as much closer financially to being able to build the trail. 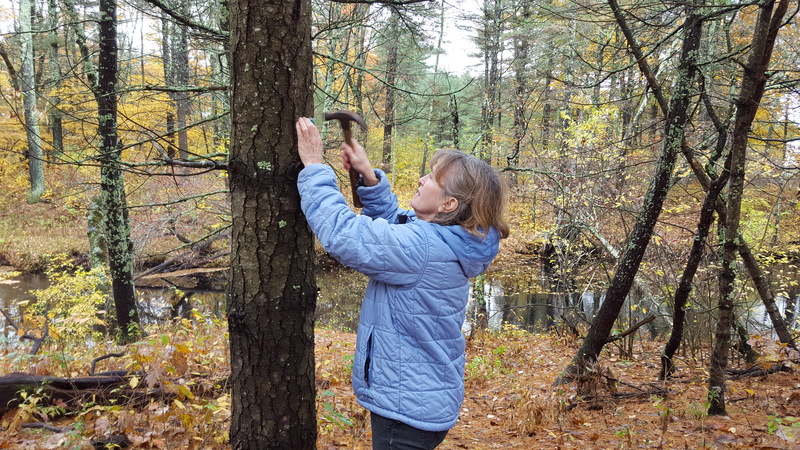 In June of 2016, Squannacook Greenways was pleased to announce that they had been awarded a $10,000 grant from the Bruce J. Anderson Foundation. This grant will go directly toward the construction of the stone dust Squannacook River Rail Trail. Informed by intelligence, sensitivity, and the knowledge of many countries and cultures, Bruce J. Anderson was a serious and idealistic young man who cared deeply about the problems he saw around him. The Bruce J. Anderson Foundation was established in 1980 by Bruce’s brothers and sisters to honor Bruce and support the causes he championed. Squannacook Greenways, with its goal of making life better and more active for all residents, but especially younger ones, is proud to have been chosen to receive this grant. 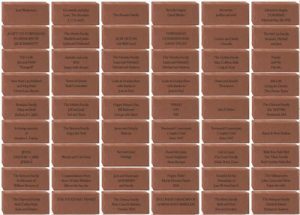 More than 150 bricks were sold as part of our buy a brick fundraiser. fundraiser, which ran until Dec. 31st. 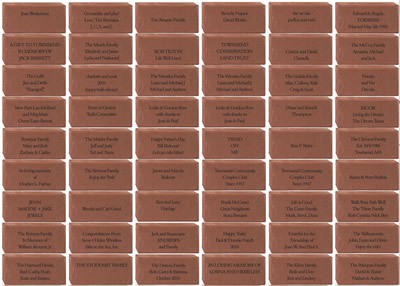 In the end, this fundraiser raised more than $18,000, and more than 150 bricks were sold. In addition, the McNabb and Reeves families donated at the granite bench level ($5000) and a number of other individuals donated at the granite pillar level ($1000). In all, our capital campaign went from $43,000 at the beginning of 2016 to $87,000 at present. Thanks to all our donors for helping to bring the start of construction closer with each donation! Finally, Squannacook Greenways has made good progress in the permitting process in 2016. Members of the board have meet with Dave Paulson, of The Natural Heritage & Endangered Species Program (NHESP), part of the Massachusetts Division of Fisheries and Wildlife. One outcome was that NHESP encouraged construction outside of the season when turtles are most active, which means that later fall and early winter would be the optimal construction period. Thanks to all our supporters for making 2016 such a great year for us, and keep on eye out on our facebook page, mailing list, and web site for upcoming 2017 activities. We are especially excited about a family activity day on the trail, with all sorts of kids activities planned along the way. See you all on the rail trail! A September 22, 2013 article in the Boston Globe on the state of bicycling in the Netherlands has lessons I think could be applied to the Squannacook River Rail Trail. The Dutch took two major steps to change this. First, they started to design bicycling infrastructure that separated bicyclists from cars. Unlike the bike lanes you might see in Boston, where bicyclists ride between the moving traffic and parked cars, in the Netherlands bike lanes are almost always next to the sidewalk. Often the bicycle lanes are physically separated from the road by barriers. 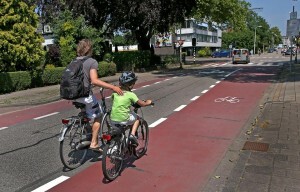 The Dutch take great effort to ensure their infrastructure works for automobiles, bicyclists, and pedestrians together. The second step they took is one that I believe is equally important – they incorporated bicycling education into their standard curriculum in school. 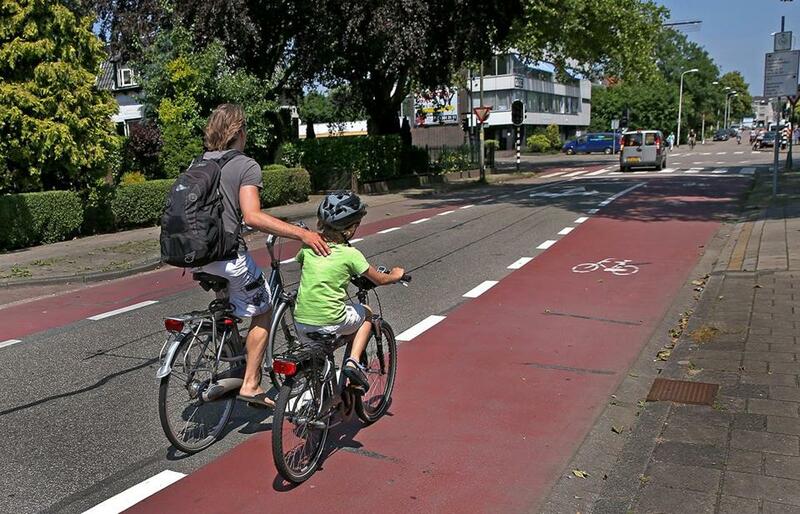 Every child in the Netherlands learns at a young age to comfortably and safely ride in traffic. So what is the result of this two-pronged approach? If you look at the pictures of who is riding bicycles in the Netherlands, its everybody! Its children riding to school, its retired folks doing errands, and its business people going to work. Most people are riding at a gentle pace wearing just their regular clothes. In the Netherlands, people ride bikes to do about 35% of their chores. So what can our group, Squannacook Greenways, learn from the Dutch as we go about building the Squannacook River Rail Trail? As a rail trail, we are naturally separated from the road. But the Squannacook River Rail Trail is not just for recreation – since it parallels the bicycle-unfriendly Route 119 and Townsend Road in Groton, it serves very much as a transportation option for bicyclists and pedestrians in Townsend and Groton. But I think the more important lesson we can learn from the Dutch is the importance of bicycle education. If we want young people to be able to bike from their homes to destinations in our area safely using the Squannacook River Rail Trail, we need to make sure they know the rules of the road as they bike to and from the rail trail. We have all seen young people riding their bicycles opposite to traffic, in the mistaken belief that if they can see on-coming traffic, they will be safer. With bicycle education they would learn that most accidents with bicycles involve turning cars, and riding opposite to traffic greatly increases the odds of a turning car not seeing a bicycle. That is why Squannacook Greenways included in our last successful grant proposal to the Community Foundation of North Central Massachusetts a commitment to bringing bicycle education to our local schools as part of the opening of our trail. If we want to make Townsend and Groton truly bicycle-friendly towns, we need both great facilities and educated users, and we as a non-profit are committed to developing both. Squannacook Greenways is proud to announce that we have been awarded an $18,000 grant from the Community Foundation of North Central Massachusetts to kickstart a fundraising drive for the construction of the Squannacook River Rail Trail. 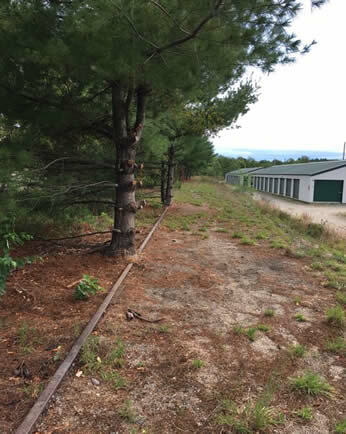 The planned Squannacook River Rail Trail will be a 3.7 mile stone dust rail trail on the existing MBTA rail bed, with a western end in Townsend center. 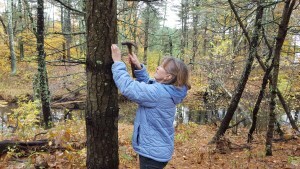 It will travel east just south of Route 119, passing behind the Harbor Village Shopping Center, where it will parallel Townsend Road in Groton until it reaches the Bertozzi Wildlife area. 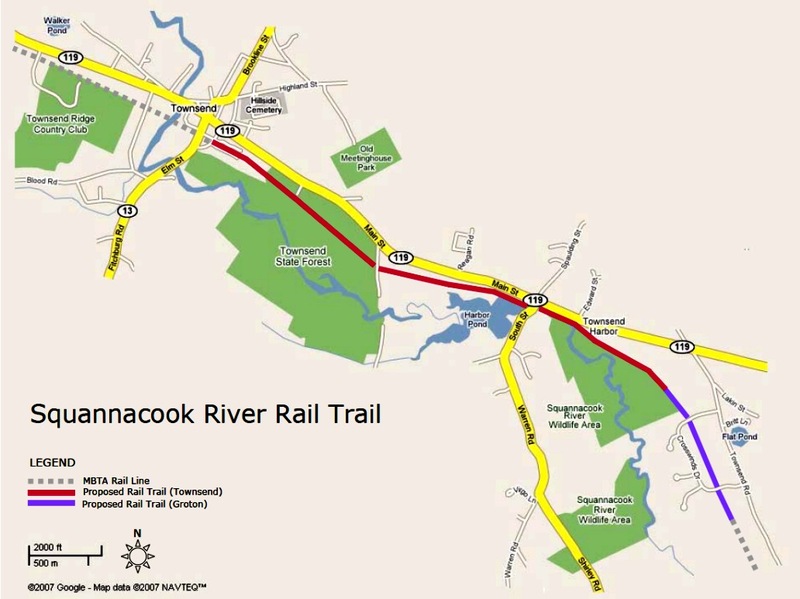 Unlike other rail trails in Massachusetts, the Squannacook River Rail Trail is not being built by a town or the state. The trail is instead being built by our local non-profit, Squannacook Greenways. All the money needed to build this trail will be raised by Squannacook Greenways. This is possible because we are building a stone dust rail trail, which is much less expensive to build and maintain than a paved trail. Our total budget for the 3.7 mile trail is between $150,000 and $200,000. For comparison, a paved trail in Massachusetts is estimated to cost about one million dollars a mile. Our trail will cost 1/20th of that per mile. With this generous grant from the Community Foundation of North Central Massachusetts, along with money given directly by our board, we are already at 15% of our goal, before we have even started external fundraising.